When I was ten years old we would visit my grandmother in Morley, Missouri (pop. 400; and just outside her back door by the large vegetable garden was an old well pump that always had a metal bucket and dipper. No water ever tasted colder, and no water was ever sweeter. She warned us, though, never leave the bucket empty because if the pump needs priming, you have to have water to pour into the pump or you’ll never get any more water. I guess that’s what this blog is doing–priming the pump again. 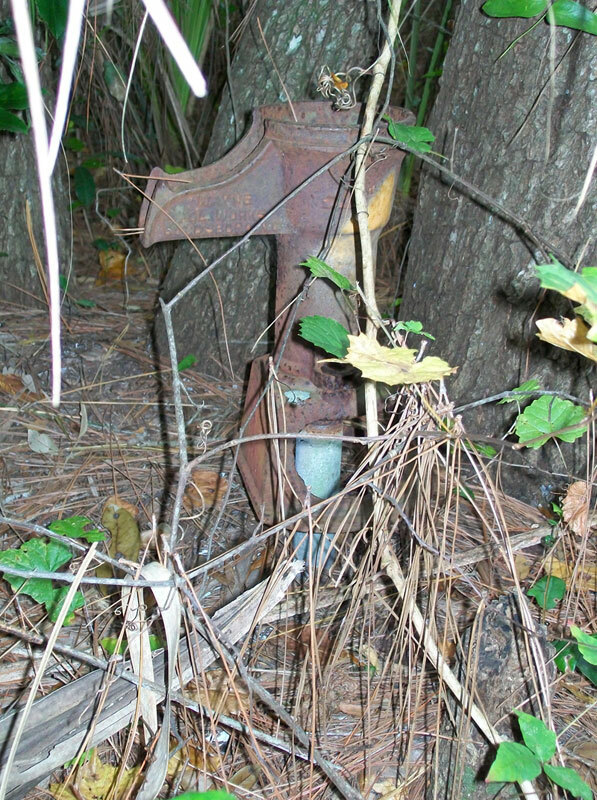 Life with these dirt roads, outhouses or sceptic tanks, and hand pumps for well water is remembered lovingly by those who experienced the times when the Freemans of Freemanville “would cook fish sandwiches and sell them to neighbors” in a picnic atmosphere on weekends. 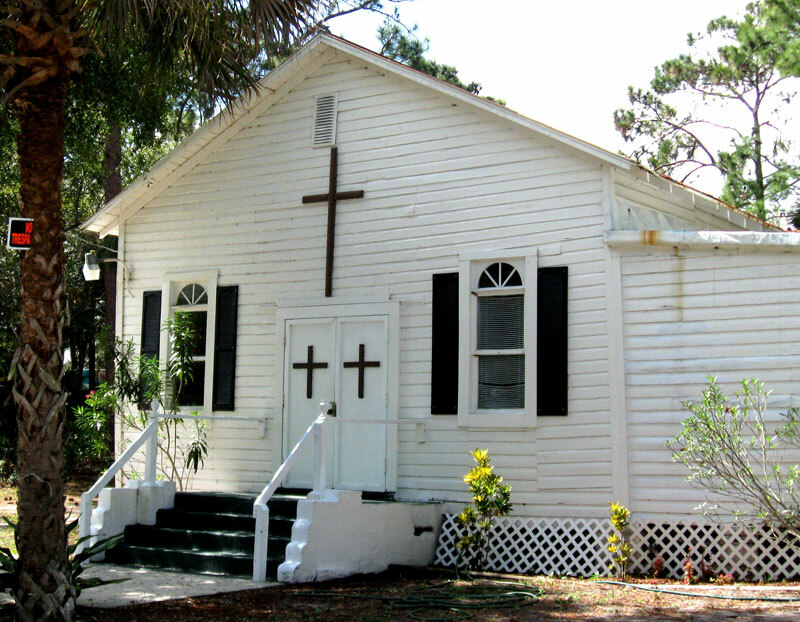 The African-American residents of the unincorporated community of the 1950s “worked in boatbuilding, netmaking, and hotel work,” as Port Orange Mayor Allen Green recalled last June in a panel of four “old-timer” Port Orangers, and he remembered that Freemanville had 10 to 15 families back then. He summarized those times when interviewed for Mary Corliss and Dorothy Dobbins’s book about Freemanville, A Free Man’s Dream (2003). “If you came from our community, the majority of the people ate out of the river,” he was quoted as saying. Virginia Moser, daughter of Alberta McCloud, told Corliss and Dobbins that she recalls that in those days she and the other children picked wild blackberries and mulberries for a Sunday treat – cobbler-like desserts they called “doobies”; and as recently as 2003, those wild berries were still growing in yards on North Orange Avenue and Valley Street. Early Freemanville citizens included Thaddeus Gooden and John Tolliver, son of Henry Tolliver, and as Daytona State College historian Len Lempel‘s research has documented, these two African-Americans were among 26 electors who voted to incorporate Daytona in 1876. Gooden worked at Palmetto Colony House in Daytona, and Tolliver engineered important sections of Ridgewood Avenue (later to become U.S. 1). Within five years, by 1881, Daytona had a population of 350, and during the 1880s, as Lempel has said, Daytona had integrated neighborhood homes with African-Americans comprising 25 percent of Daytona. The freezes of 1894-95 destroyed many orange groves, so men of Freemanville went to Daytona for work. 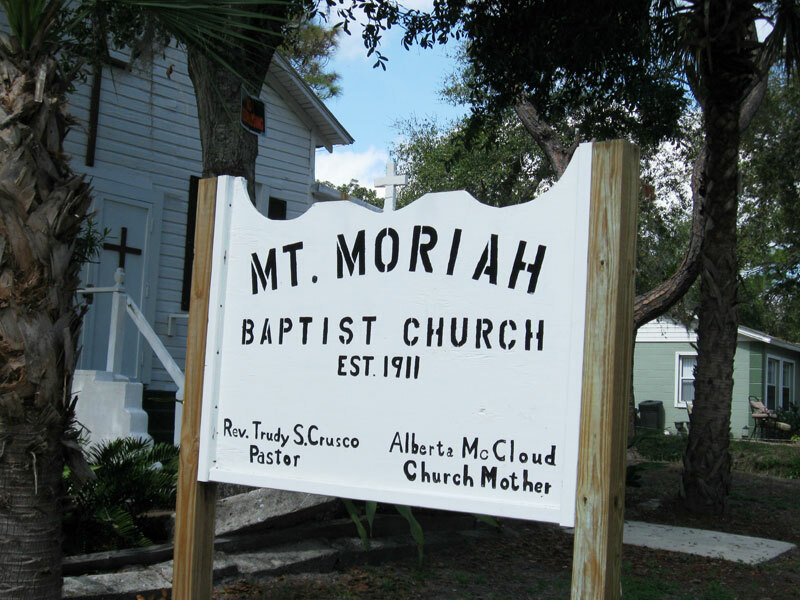 The majority of Blacks moved from the Mr. Zion Methodist Church in Freemanville to New Town, a Black community in Daytona. World War II also took residents from Freemanville at the time that all of Port Orange had a population of only 600. Bad storms of 1947, 1949, and 1956 may also have made living in Freemanville more difficult. One such storm flooded the river to U.S. 1. Alexander Avenue memorializes one of the Black Civil War veterans, but no tombstones remain today because wooden markers have been lost over the years. 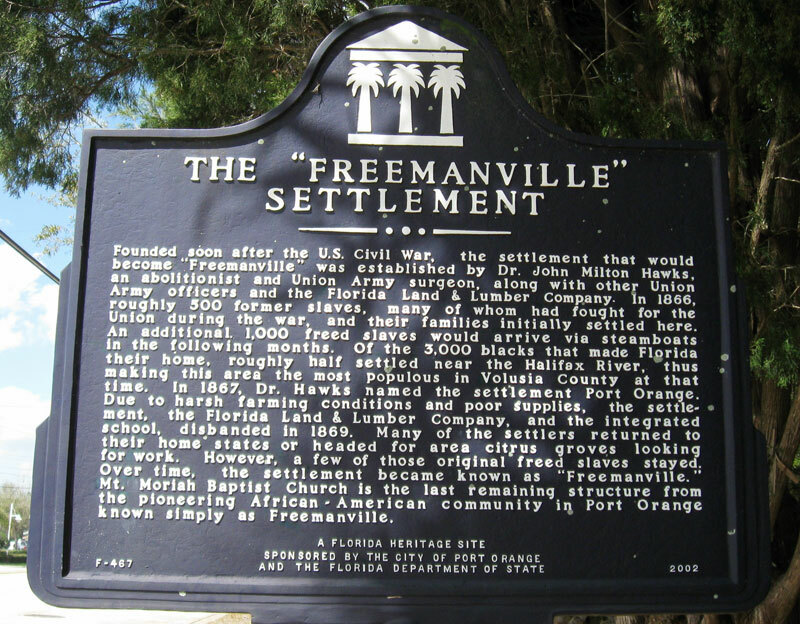 Local historians Priscilla and Harold Cardwell wrote that Freemanville before the 1930s extended east across Dixie Highway, which became U.S. 1 in 1931. Its roads included West Ocean Avenue (south), Valley Street (north), Alexander Street (west), and North Orange Street (east) with Magnolia Street also lying within this section, running parallel with West Ocean Avenue. The Cardwells also documented with old maps that Settlement Road ran north and south through Freemanville. A map handwritten from memory by Maxine Cullen indicates that “section quarters” homes, including hers, were along a dirt road north of Valley Street. This appears in the book by Corliss and Dobbins. The Cardwells have noted that what was known as the old Spanish Canal (or Daughtry Canal) drains the hammock and runs east from Freemanville just north of Magnolia Avenue from Alexander Street, crossing North Orange Avenue, and U.S. 1 into the Halifax River just to the north side of the Port Orange-South Daytona Chamber of Commerce. The main canal and smaller ditches were originally dug before the Second Seminole War of the 1830s so sugar cane could be grown on the Dunlawton Plantation.